By reconstructing her past from memories, letters, childhood drawings and animation, Macarena Aguiló Marchi attempts to understand why her parents sent her abroad to be raised by strangers while they risked their lives back in Chile fighting the Pinochet regime. El edificio de los chilenos is a film about children who lost their parents under the relocation project Proyecto Hogares, as well as the parents who not only lost the Revolution, but any chance of ever seeing their children again. Winner of the Grand Prize at the FIDOCS festival in Santiago, Chile. Macarena Aguiló Marchi was born in 1971 in Chile. 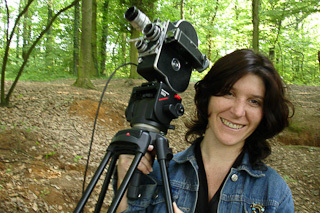 El edificio de los chilenos is her first film, and after this autobiographical production, she also contributed to the work of other documentaries including Final Image and The Other Side of La Moneda.